This time of year, we celebrate the harvest of late autumn and enjoy all the local foods we can serve on our tables as winter sets in. That cool-weather bounty has led us to also reflect on some of the Farm to School work made possible by the Charlevoix County Community Foundation this past year, and in previous years. The foundation’s work also brings local food to tables—in classrooms and school cafeterias—and makes important progress toward creating a school culture of health. Check out these Farm to School highlights that Groundwork has been involved with in Charlevoix County, all of which have been supported in part by the community foundation! Our work in the Charlevoix area really began with Building Healthy Communities program and was quickly followed by our FoodCorps program in Boyne Falls Public Schools 2016. Lindsay Hall paved the way for excellent service as our first FoodCorps AmeriCorps service member here, in what we’ve been calling the Northern Farms Foodshed. Casey Haggerty picked up that torch this past fall. 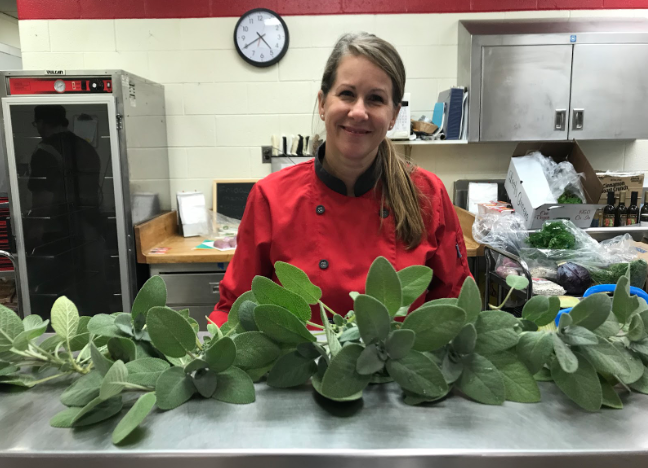 She has continued monthly tastings in the cafeteria with Chef Nathan Bates, collaborated with teachers on food-related lessons in the classrooms, and inspired students to get their hands dirty in the hoop-house gardens. The dedication of the staff at Boyne Falls Public Schools is fast becoming the blueprint for rural schools that see the importance of creating a healthy food culture. None other than the godmother of local food, Alice Waters, visited the school in 2017 and said it was a national model. Making veggie dip and taste-testing apples at Boyne City Public Schools. 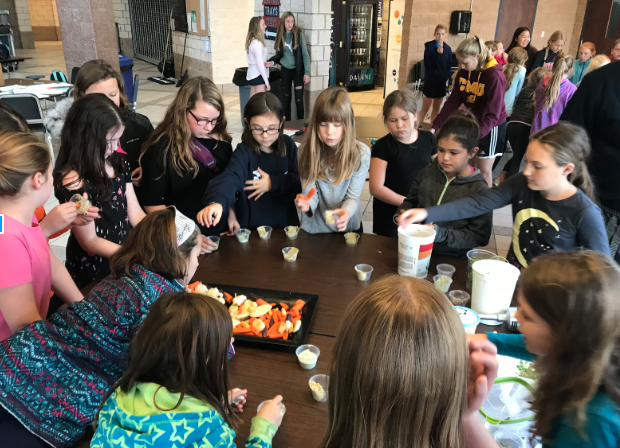 Our invaluable partners at Health Department of Northwest Michigan have been able to work with Boyne City Public Schools to help set up a salad bar in the elementary school and get farm-fresh fruit and vegetable tastings started. As Groundwork’s Local Food Policy Specialist, I had the pleasure of working with many 3rd and 6th graders in the Girls Get Fit group on Oct. 29, 2018. Over 60 students were trained on how to conduct an apple tasting, featuring Dionne Farms apples. Students also made vegetable dip from scratch. Several students said that nutrition day was their favorite day of the year! Lunch the day I visited was delicious and featured fresh tomatoes, tri-colored bell peppers, onions, lettuce, cauliflower. I conducted a cauliflower tasting: 71% of students loved it! 29% liked it, and 25% were brave enough to try a new thing. This school, newly awarded the 10 Cents a Meal grant, was also connected to a local farm that was able to provide items Kathie couldn’t get through other sources, so even more good local food could be offered on the tray line. Have you heard about Charlevoix Montessori Academy? The enthusiasm here makes up for the school’s small size of 50 students. Groundwork staff sat down with the administrator, Amanda Minaker, a couple of weeks ago, and the school already has plans to implement the Harvest of the Month offerings—carrots in December, parsnips in January, frozen berries in March and dried beans in April! We can’t wait to see how the students respond. dinner. (Thank you Crooked Tree Breadworks for the bread!). We can’t say enough about food champion Melissa Lyons at EJPS. Her vision is steadfast—feed healthful, locally grown, made-from-scratch food to students, while supporting area farmers, such as locals Mary and Aaron Brower of Bluestem Farm. Groundwork is proud to, most recently, collaborate with EJPS on offering a crockpot class in early November to school families. Thanks to sponsors like Fresh Baby and Fustini’s Oils & Vinegars, families were able to take home a crockpot, ingredients for Harvest Chili, a set of knives, vegetable peeler, cutting boards, measuring cups and spoons, and several crockpot recipes, along with oil and vinegar. Students put together a delicious salad to accompany the soup and bread dinner, at which they enjoyed the fruits of their labor. The school has also started a garden with herbs, potatoes, and other staples to use in the cafeteria. This school is on a roll, and we’re glad to be part of it! 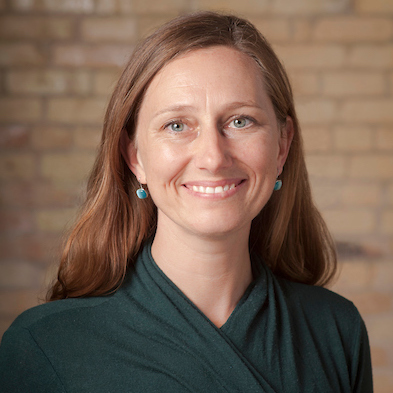 Groundwork is so fortunate to have so many collaborators in Charlevoix County as we work to achieve our goals in creating schoolwide culture of health, and so many of their efforts are nurtured and helped along by the Charlevoix County Community Foundation. Bring on the cozy by filling your home with the aroma of crockpot dinners. The nine recipes in this download are taste-tested by our team and get the delicious seal of approval.